Get UpLyfted! Natural-looking volume for your cheeks & NOW HANDS. Sometimes a side glance in the mirror or reflection in a window renders you frozen, wondering when that older version of yourself appeared. Or maybe a glance down at the hands in your lap gives you pause as you notice the changes the years have imparted. Doesn’t it seem to happen overnight? Well, it doesn’t. The aging process is, indeed, gradual, but it reaches a noticeable tipping point … or maybe that’s a sagging point? Lines and wrinkles are hardly the only pitfalls of aging skin. Maturing skin also loses significant volume as healthy fat deposits deteriorate and underlying supportive tissue weakens. The resulting volume reduction causes sagging, produces hollow areas, and makes wrinkles appear more obvious. To combat these cases, the skin tissue needs a boost from injectable dermal fillers such as Restylane? Lyft by Galderma. NOW FDA-APPROVED FOR HANDS! 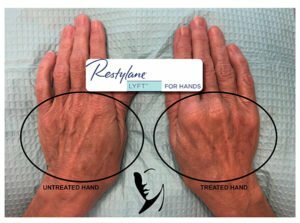 Restylane Lyft is specifically designed to add fullness to the back of hands for a more youthful looking appearance. An advanced hyaluronic acid gel, Restylane Lyft is carefully injected into the deeper dermal layers adding beneficial volume from a special formulation of this cushioning substance. Hyaluronic acid (HA) already works within the body, as naturally occurring molecules that bond with water to keep tissues supple and hydrated. The Restylane Lyft formula gel creates an optimal balance as it refills sunken areas with an HA gel ready to replace what time has diminished on the face and even the backs of hands. Restylane Lyft injections are performed in-office with no recovery time. The clinician examines the treatment area to determine the best injection sites and the amount of formula to use. Then, a numbing cream applied to the area provides a comfortable barrier before the injections begin. While there may be some temporary redness or swelling at the injection site, that subsides and dermal tissue responds to the filler almost immediately. The beautiful results last up to a year and merge seamlessly into the contours of the skin for a graceful, rested look. Pay special attention to your skin with special attention from our RFPS team. Call 770-667-3090 to book an appointment for a consultation to discuss Restylane Lyft for added fullness.